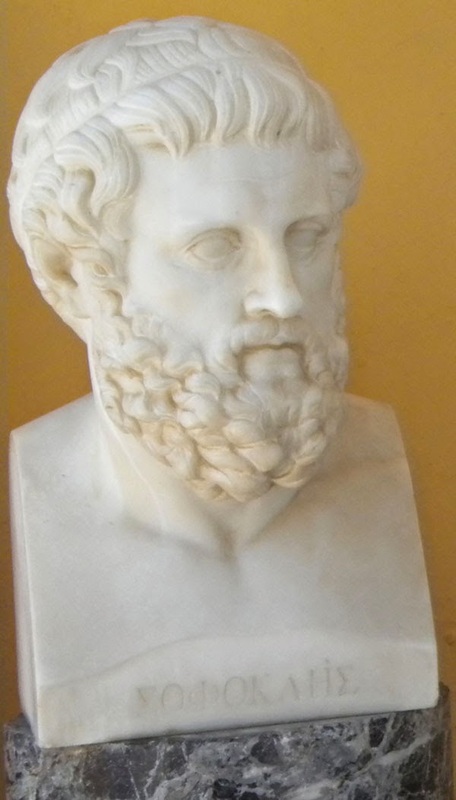 Sophocles (c.496 B.C.–406 B.C.). Oedipus the King. King Œdipus of Thebes as a babe was abandoned on Mount Cithæron to die. Years after he was thought dead he returns to Thebes and unknowingly slays his father, marries his mother - and thus fulfills the word of the oracle. Uplifting in your hands the suppliants’ boughs? To wing their flight, and some weighed down with age. Oracular that bears Ismenus’ name. And Hades dark grows rich in sighs and groans. Men think and say, thou guidest all our life. Come, save our city; look on us, and fear. Or tower or ship, when crew and guards are gone. Failing to do whate’er the God declares. Bright with the cheer of one that bringeth life. His head all wreathed with boughs of laurel else. What sacred answer bring’st thou from the God? Nor trembling panic, list I to thy words. CREON. Well, then, I speak the things the God declared. CREON. Drive into exile, blood for blood repay. ŒDIP. But whose fate is it that thou hintest at? Our sovereign Laius ruled o’er all the land. ŒDIP. This know I well, though him I never saw. In some strange land that Laius met his doom? And nevermore came back as forth he went. From whom, inquiring, one might learn the truth? Unless some bribe had tempted him from hence. Found none to help, or ’venge him in his woe. Had fallen low, from searching out the truth? ŒDIP. Well, be it mine to track them to their source. Pray that he come to heal, and save from woe. [Exeunt CREON and Priest. To Thebes, of high estate? Tell me, O Voice divine, thou child of golden hope! Thou seest them passing on. And chant their wailing plaint. And the low anthem sung in unison. And send us help, bright-faced as is the morn. With battle-cry wars on me fierce and hot. Which sweeps the Thracian shore. Blast him with thy hot thunder. She moveth on her course. Against the God whom all the Gods disown. Unless some footprints guided me aright. May every curse I speak on my head fall. Belongs to him who sent this oracle. CHORUS And may I speak a second time my thoughts? ŒDIP. If ’twere a third, shrink not from speaking out. Teiresias, one might learn, O king, the truth. CHORUS Old rumours are there also, dark and dumb. CHORUS ’Twas said he died by some chance traveller’s hand. ŒDIP. I, too, heard that. But none knows who was by. ŒDIP. Words fright not him who, doing, knows no fear. CHORUS Well, here is one who’ll put him to the proof. Chosen of all men, vessel of the truth. Forgot, alas! or else I had not come. ŒDIP. What means this? How despondingly thou com’st! Who reared thee, holding back this oracle. Ill-timed, ill-omened, that I guard my speech. So speak my sorrows as to unveil thine. But giv’st to ruin both the state and us? All vainly urge it? Thou shalt never know. That which dwells with thee while thou chidest me. The words which bring dishonour to the state? And thinkest to escape thy righteous doom? TEIR. Thou art the man. ’Twas thou who mad’st me speak. Didst thou not know? Or dost thou challenge me? TEIR. I say that thou stand’st there a murderer. ŒDIP. Say what thou pleasest. All in vain ’tis said. Nor seest the evil thou hast made thine own. ŒDIP. And dost thou think to say these things and live? TEIR. Of that I doubt not, if truth holds her own. Such, all too soon, the world will hurl at thee. Suffices. His the task to bring thee low. ŒDIP. Are these devices Creon’s or thine own? How great the envy dogging all your steps! Is it not so? When wast thou known a seer? Didst thou not give our countrymen thy help? Of common men, and called for prophet’s skill. And think’st to take thy stand by Creon’s throne. Thou shouldst be taught what kind of plans are thine. And thine, O Œdipus, in wrath are said. How best to do the bidding of the God. For I am not thy slave, but Loxias’. Against thine own, the living and the dead. To which thy prosp’rous voyage brought thy bark? Who wastes his life more wretchedly than thou. ŒDIP. This can be borne no longer! Out with thee! Wilt thou not turn and wend thy backward way? TEIR. I had not come hadst thou not called me here. But, for thy parents, who begot thee, wise. [Turns to go. ŒDIP. What riddles dark and dim thou lov’st to speak. TEIR. Yes. But thy skill excels in solving such. ŒDIP. Scoff as thou wilt, in this thou’lt find me strong. TEIR. And yet success in this has worked thy fall. Thou canst not pain me more when thou art gone. Feeling his way, to other lands shall go! Say that my skill in prophecy is gone. [Exeunt ŒDIPUS and TEIRESIAS. With bloody hand his nameless deed of shame? To bend his course in flight. And lightning flash, the radiant Son of Zeus. The Destinies that may not be appeased.